The last year and a half has been one of tremendous change and growth here at Floret. It is only after compiling a list of major projects that we’ve tackled that I can truly wrap my head around it all. We offered our last on-farm workshop (for now, at least). We offered our very first online workshop. We expanded our product line. We switched to a new online shop platform. We expanded our team. We bought the farm next door. We started a massive renovation on the barn that will become our new shipping area. We launched a best selling book…and then started writing a second book… We’ve done A LOT. Each one of these projects was a ton of work. But the fact that we did them all within such a short period of time is nothing short of miraculous. Now that we’ve caught our breath, we’re reevaluating what lights us up and what we want to focus our collective energy on as we move forward. One of the biggest topics of discussion has been dahlias. As you know, dahlias are one of our favorite crops, but they come with a very specific set of challenges, including highly skilled labor for dividing tubers, proper storage conditions, a large storage facility, and a expanded shipping team to get tubers out the door in a timely manner. In an effort to improve the process for our customers and our crew, we have decided to push pause on tuber sales this autumn. I know this will undoubtedly disappoint a lot of people. And I know that the demand for dahlias is tremendous. Since we started offering them a few years ago we have consistently sold out in less than a day. Even after quadrupling our offerings this past year, we still sold out within 24 hours. Dahlia mania is a real thing! We are committed to making the experience of sourcing and growing these treasured varieties better than it’s ever been before. But the only way to do that is by pushing pause and taking the time to figure out a better way. I’d love your thoughts and ideas. Floret fans have always been so generous in sharing their feedback whenever we’ve needed help. For example, your ideas were instrumental in shaping the outline for Cut Flower Garden and Book #2 which is currently in the works. Through reader surveys, we were also able to develop the content for our educational programs, including the Floret Online Workshop. I so value your thoughts and opinions and would absolutely love it if you would take a few minutes and share them regarding dahlias. Thanks in advance for your thoughtful feedback and for your continued support as our little flower farm grows. I am so grateful for all that you share. Hi! So does this mean you are pushing pause for this season only? Perhaps you will be back to selling dahlias next year for 2020? I hope when the tuber sales come back, you’ll continue to offer the varieties we can’t find anywhere else. Maybe I’m not searching hard enough, but Hamari Gold? Where else could I find that? Hi Kirsten, We’ll be putting together a list of domestic dahlia sources later this year. Most won’t have their availability listed just yet, but hopefully we can help you track down some Hamari Gold tuber for next season! 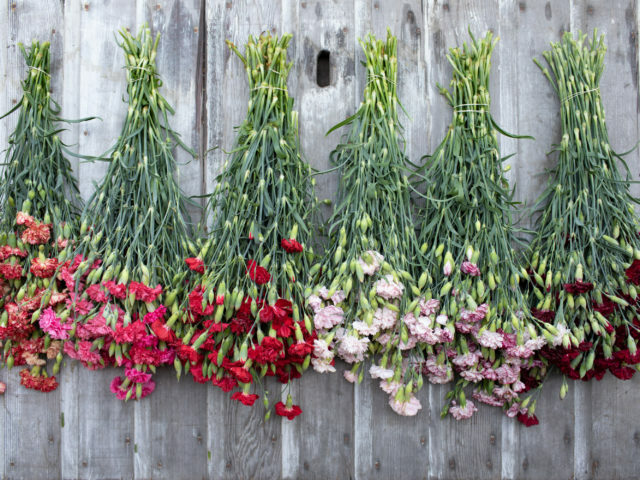 Your growing flower farm business is an inspiration for aspiring flower farmers! And your product is simply gorgeous. Thanks for the constant source of inspiration and exposure to new varieties. You have definitely become an influencer in the industry for exploring new and exciting fleurs! WAHHHHH. I missed the cut last fall and have been looking forward to your unique dahlias this fall. I agree with Paula, if you could throw out a few recommendations on unique dahlia sources, that would be fantastic. I so very much admire the types of dahlias that you have to offer and I’m disappointed that they won’t be for sale next spring but I am hoping that you can recommend another source we can purchase them from for the time being until yours comes available again?? Hi Paula, thanks for understanding! We do plan on putting together a list of recommended sources to find dahlias–stay tuned! Thank you for all yout info, guidence, and your wonderful philosophy to share knowledge with gardeners and small flower businesses around the globe! My daughter started a successful wedding floral business in her home, a couple of years ago in Anaheim CA called Julep Bloom Designs. She started her business with little knowledge or skill of flowers but with time and practice and open teachers like you she has learned so much to become a success! 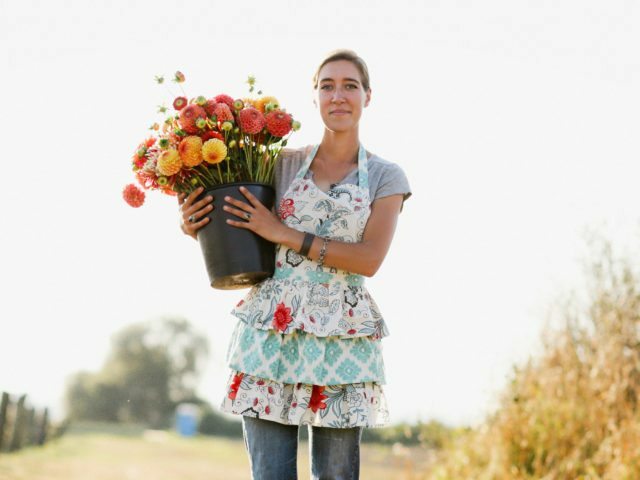 Floret farms became a true inspiration to her to keep at it! In 2017 I bought a house and land in Skagit county on the edge of the farms in La Conner and for my very first garden I put in was ALL Dahlias! Beautiful of course but I had know idea how to divide and store in the fall. Thats where your book came in! And from your advice I was able to divide the tubers and to my surpise many survived this past winter and in full growing mode now! My daughter bought me seeds from your farm for Christmas and growing well in my garden today. Some types I have never grown and excited to see the reaults. Sadly you will not have dahlias for sale this year but hopefully another year? 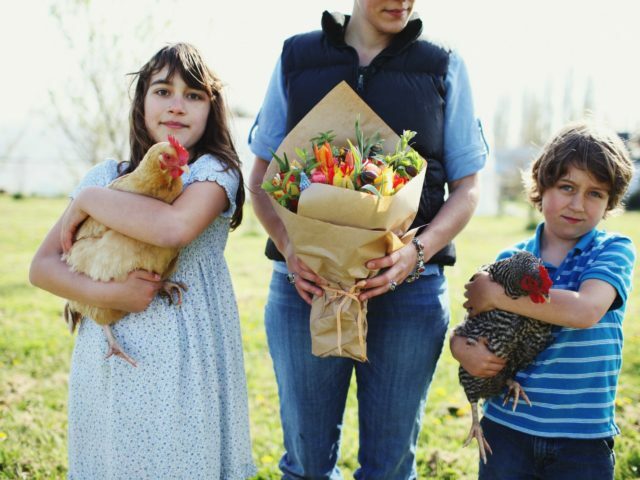 One thing my daughter and I have wished for is if you could offer short tours of the farm and growing operations…. Good Luck this year in all the farms endeavors… look forward to your new book. I think I read its on flower artanging? My floris designer daughter will be very excited about that! Thank you so much for your insight, expertise and thoughtful knowledge. I bought your book a few weeks ago and have being enthralled with reading it – layering the learning and enjoying the process. I just watched the first video on pinching and….marched out to my cottage garden like a good Garden Soldier pinching – but remembered your words about how difficult it is to cut those dahlia, zinnia and cosmos buds. I’m happy to say I did it! Thank you for providing me the knowledge and strength to do it!! From one of your biggest fans in Northern California. You’re on my bucket list of places to visit the next time we are in Seattle. Congratulations on continued pursuit of your goals and dreams!! I like others look forward to see the continued evolution of Floret. What always inspires me is your attention to detail and the visual beauty. Sharing your knowledge in a simple and straightforward manner we all can wrap our heads around. While I will miss having the opportunity to order those gorgeous Dahlias next Spring, I will anxiously await their return. First of all … Y’ALL ARE MY HEROES ! You have totally changed how I look at and grow cut flowers in my garden. I purchased your book this past March, it has been a wonderful wealth of information. Yesterday , I received the first video on pinching flowers. Today, this very morning, I pinched back my zinnias. I am excited to see the results and the abundance of flowers. Keep those videos rolling in ! Secondly, I live in East Texas , so growing dahlias is not an option. I tried our first year growing dahlias, the Texas heat just destroys them. I grow other heat loving cut flowers that can withstand our intense heat. Lastly, I agree with the other folks on here, it’s okay to take a break , regroup and focus on what has been successful, instead what is not working at this moment. I find at times when I am dealing with garden issues…the answer to fix the issue comes when I am doing another chore or taking a giant step back and looking at the Big picture … the answer is sometimes in the smallest details and easiest fix. I am learning these exact same lessons with our daylily business. I wish you continued success personally and professionally. Wow! You have packed in so much in a short period of time. I get tired just reading about it. Take the time you need, you know what is best for your family and business. I will continue to learn from you and look forward to your future success. I think you know your business better than anyone. And if taking a step back and giving up a season for finding the best plan of attack is what you know in your bones to be the right choice, then so it be. Efficiency is profitability in farming… period. So if an arm of your operation is not performing optimally, I think you SHOULD reconsider how you are executing its operation. With that said, I personally, within my own experience and knowledge in “mass producing” dahlias, they are labor intensive with the caveat of being so popular on all counts that the profitability compensates for that. They have probably been one of the most, if not THE most, productive crop I have tried in regards of flower production, propagation and marketability. Without going too far into your business model where your efficiencies are lacking enough to warrant pause, it’s difficult to say where you can tweak your operational practices. So taking a wild guess at it, I’ll assume that labor is what is bogging down your dahlia operation. My operation is probably only about a tenth of yours so keep in mind that scale definitely plays into taking what I say with a grain of salt. 1. Divide only your most robust and giant, ridiculous tubers. The ones that really should have been divided perhaps the year or two prior. This will cut down on time in labor and you will have a bit less product but it fits to scale and it’s better than nothing. Also what you are shipping is a SUPERIOR product that will rarely fail the end user. As you know, a very strong divided tuber is so much more reliable than one that you only divide once and has to re-establish when planted the following spring. Less to cut. Less to package. Less to store = less labor. 2. You probably already have a place you can store tubers that you just have not realized yet. Find areas around that are not in use during dormancy months and store samples. 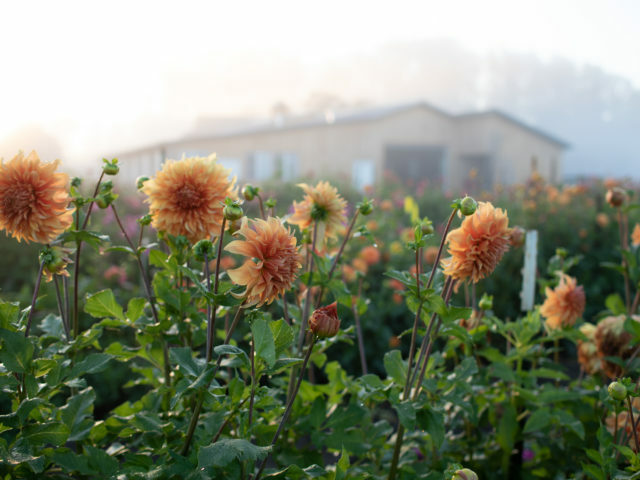 Find out if these areas you identify possess the conditions that harbor dahlia dormancy in small batches you can afford to sacrifice. I found out that my attic of all places, though it feels bone chilling cold in the winter up there to me, dahlias have no problem hanging on to life up there. One disclaimer though… I think if we got a really bad winter with an abnormal (but possible) cold spell, that area would not support them. In three seasons that has not happened yet, so I consider that area a relatively reliable storage resource. I surmise that the small amount of heat rising inside my house and heating the ceiling, dissipates through the drywall and slightly heats the air in my attic and is trapped by the roof. That along with low air exchange and sunlight heating the shingles, allows it to stay well enough above raw outdoor temps. The rafters provide plenty of spacial access to hang bags of tubers. If you are worried about weight, don’t be. It is impossible to overload the capabilities of the standard roof truss with the weight density of a dahlia tuber. Think ton of feathers versus ton of bricks. The weight is distributed across a larger area. Yes, I looked into it and asked no less than 3 professional carpenters their opinions and none of them could see any reason for concern given the average weight per bag and how many bags you could reasonably hang on one truss. Hopefully this at least turns some gears for you and you come up with an affable solution. Then you’ll be saying to yourself “why didn’t I think of this all along?” HA! Dear Erin, I’ve Followed you almost since you’re inception here from the East Coast. I have most recently taken the Floret online course and appreciate all the detailed information you were willing to share with us. I have found over the last 20 years of farming that it is a good thing to re-evaluate each year as to how things might be done in a more efficient or peaceful manner. I agree with the previous posting that years flyby with children and friends and family relationships and there is always another attractive Farming venture tempting me to begin next year. “Stay dedicated to your first love because others will be sure to tell you what they think you should be doing” was something a very dear older friend of mine told me when I first bought our farm. We decided to Enlarge our cut flower growing this year and train two floral grower/designer interns, however this year we had an extremely long, cold winter followed by an unusual hot spring which wrecked havoc on all of our plans. We are behind in every way possible BUT the best lesson being learned by our students is to understand this happens, keep working hard, moving forward and be hopeful for the future! Thanks again for your dedication, hard work and sharing at a practical level when these days most people are too afraid or competitive to share their knowledge. Blessings to you and your family! Honestly. I love your insight and the amount of knowledge that you share more than your dahlia offerings. Your book has been read over and over in my home. It sits on my coffee table. I reference it all the time. I love your gentle voice in your blog. I love seeing the beautiful photography. I swoon over your abundant arrangements and it inspires me to create my own. I love how you try a lot of different varieties of flowers and then share with photos what ones are your favorites. You did that in the past with your dahlias. I was able to hunt them down from other providers. I have been one of the customers who doesn’t get the dahlias the first day and then I am disappointed. I ended up ordering ones that I wasn’t as excited about. But you have definitely made me a dahlia lover. All this to say, I think it is smart to focus on what you love because it will be what you do best and we will sense your joy in it. Thank you for all you share! I can’t wait for the next book. Have you considered having people pre-order Dahlia tubers? It would be wonderful to have a zone map for growing cut flowers. I am in SC now although I hope to be in KY soon. Heat here, extremes there. One day 80 next day 40 in the spring. Also cut flowers that support bees and birds. Too big an ask? I love the book and the presentation! Buy and grow has been a breeze, I had a tuber show up soft and discolored, you sent a replacement instantly and all has grown beautifully. Thank you for the prompt and very kind help! My daughter and I both grow dahlias here in east county San Diego. We love them!! But don’t have near the variety that you have on your website with beautiful colors too. Would like to order next season but it sounds very competitive as to who gets there first? We would love to take the workshop maybe in future. Last fall, I was fortunate to order dahlia tubers from you, which are about 8″ tall now. I could only get 4. 😒 Unfortunately, the tubers I bought from another company have not made an appearance yet. I am excited to see the visionary approach you are taking…in the case of plant stock, the future should be just as important as the present. I am not growing dahlias presently, but want to start next season. Hope to purchase some from your farm…have to look in your book for other venders as well. I love seeing the dahlias you have, but it wasn’t an option for me to purchase being in Canada. Most of the options you have I have not been able to find in Canada, but it’s great eye candy that I appreciate. Businesses evolve, I’m sure everyone can understand. It is nice to have a one stop shop for all the ordering, so if you could be a reliable source for everything that would be great, but until then, it may be better to specialize in a smaller diversity of product. As a Canadian, with the exchange rate and shipping limitations, I look to Floret more so for education, information on your website and books, and maybe one day your online couse. Keep up the good work and do what is best for you and your business. That said, by all means – take your time to think through how it works for you, and if it doesn't work well for you, then we will all miss that part of Floret, but we will be excited for what you all think up next and will always treasure the tubers we have from you, and do our best to tend to them, so they grow and multiply with us for many years to come! 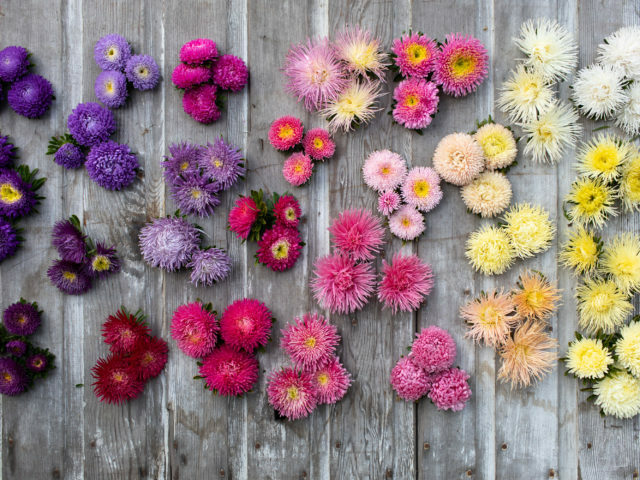 I am a small cut flower farmer in coastal Maine. (On the line of 5a/b) I appreciate your descriptions of the dahlias and how they behave. I love all pictures that I see of dahlias! (especially yours) They are magical in their colors. But not all are really good as a cut flower. So when you mention their usefulness as a cut, it helps to know that. I also appreciate some mention of what other ones you pair them with. It tweaks my color sensibilities. While the dahlia world talks about size, shape and color – you rock when you talk about stem length, vase time and what kind of producer it is for you. Things I want to know as a grower. As for selling out, it is the nature of the business and the whims of the buyers – no telling what we all want each year! Keep up the good work and thank you so very much for sharing all your gardening/growing knowledge with us! I have not ever grown dahlias. I recently moved from Minnesota to the desert in Saint George,Utah and I’m not sure dahlias will do well here, zone 8. I actually do not lust after dahlias, I get my fix growing lovely zinnia from seeds purchased from your farm. I would encourage you to slow down your growth and take a breather. Nothing is more detrimental to a small business than trying to grow too fast. Erin, I agree with the posts encouraging you to stay focused on your marriage and family, and doing what you need to do to make it all work. You can always decide to jump back into dahlias, but you can’t get that time with your kids back. And I want to encourage you – you’ve been an inspiration to so many of us. I’ve grown dahlias and other flowers for years down here in hot and humid zone 7B (central NC) but I’ve just taken the plunge into selling flowers. The techniques you recommend are great but I think that folks need to be realistic about their own situation, experience, the need to adapt and that we are not and cannot all be Floret, so to speak. I would like to also say that all of us who follow you so avidly also need to be unselfish, and show some love given your (appropriate) limitations as a small family business. Many companies that sell dahlia tubers run out of desirable, hard to find varieties quickly, and that’s just the way it is. You’ve built a loyal following but I don’t think that you need to take personal responsibility for selling out quickly. Many of the varieties you sell can be purchased though other growers – this is good for everyone. Yes we totally hear you re: the whole high-maintenance piece. Digging them up is reasonably hard work. My results from leaving dahlias in the ground were very mixed given the extremely cold winter here in 2017-2018. Recently I switched over to growing dahlias in large plunge pots because of the storage issue, voles and lack of space and this has worked well, though it would probably be too labor intensive for a large operation like yours. I think there are several good reasons for you to hit pause on selling dahlia tubers. For those varieties that are not good tuber producers, you could leave some clumps undivided to see if they form better clumps with better tubers. You can do a business analysis. You can take a rest : ) You can train teams of people during the off season to help with the skilled labor. Finally, you can take a careful look at your plants to see if you can identify dahlia virus infected plants that need to be culled, to try to address the widespread serious problem of dahlia virus and viroids. This is a big problem. A high proportion of plants grown from tubers (as many as 30-40% of some varieties) from commercial growers show signs of virus. So i start all of my tubers in March in pots and cull out the virused ones before setting them out. Just a few suggestions for you. Keep on keepin’ on! Regarding some dahlias, I seem to have trouble even getting them to emerge from the soil. One local dahlia society member advised me that dinner plate size dahlias do not do well in our area and that seems to be true. It gets too hot here in the summer. So I try to buy medium sized ones. Dahlias are one of my absolute favorite flowers and I would like to continue to experiment with them. I would like to know if there are any farms or sources who do not treat their bulbs with fungicides before shipping. I.e., I’m looking for organically raised bulbs if possible. I believe your farm does that but I’m not sure. I have your book and love it. Thanks for all the beautiful photos and information. Now if I can only grow ranunculus – I did not have much success with those this year either despite reading your instructions. I love all your pictures and well everything. Except I was not a fan of when I received my box of dahlia tubers they were not sectioned out well. I had to sit and organize through them to figure out which were which when it came to planting. Better labeling for the individual types of dahlias. Name and the color of the dahlia ON the packaging for that dahlia. I also received a refund automatically after like a month. for some dahlia tubers that you ran out of. And no explanation as to what that was for. So it wasn’t until 4mo later when I got my tubers that I realized my favorite one wasn’t coming. Very dissapointing. It’s just like fishing…sometimes you need to close the season in order for the fish to regenerate. I have missed out on your dahlia sales and am looking forward to a healthier inventory in the future. Floret Farms Cut Flower Garden has been so helpful and such an inspiration to me. Thank you for all your hard work and dedication. So many gardens and gardeners have benefited and blossomed thanks to all your endeavors. This gardener so appreciates all you’ve given me. You can’t be all things to all people—after all, Swan Island has 40 acres, and that’s all they do. I applaud your decision to think things through. just read your book absolutely loved it and your pictures are amazing. You have sparked my mind. My mother grew dahlias here in Ireland when i was a child and we all loved them neighbors and all. Then dahlias fell out of Fashion plus our pet rabbits loved them too. Dahlias remind me of my mother who sadly passed away 2 years ago. I am just after potting up some I got in my local shop and intend to start a collection again. My mother had all sorts in all colors back in the 70s they are hard got now. I have memories of helping dig them up before the winter and storing them in wooden crates in a out house and re planted the following spring when frost has passed. Hugh tubers. Thank you for reigniting my lovely childhood memories. I also have planted a large bed of mixed flowers just for cutting. looking forward to this summer. I hope you’ll take us with you on your dahlia journey -what you’ve learned, what works for you and what you will change because we’re all learning right beside you. One thing I absolutely love about Floret and what I hope you won’t change is keeping a really carefully curated collection. Through your trials you have selected the most beautiful dahlias -gorgeous forms and color palettes and your photography is fantastic – it’s eye candy and it makes shopping a pleasure. Even if Dahlia ‘Cara Elizabeth’ makes one good tuber a year I will wait for it! There are so many ugly dahlias out there to sift through or great dahlia growers who have horrid websites with tiny thumbnail pictures that you can hardly see. They could all take a page from your book. You have a great team and you’ve been growing dahlias for a long time so I have no doubt that whatever improvements you make will be fabulous and we’ll be waiting! Dahlias are so beautiful not to mention the amazing colors they come in. It is understandable that you want to pull back and reevaluate things, however, dahlias are a favorite of your customers. Is it a good idea to scale back on what you have come to be associated with by many? This seems like a project that will be worth the effort both in the short and long-term. Anyway, I hope you make the decision that will be best for your business. Maybe I misread the post and survey, but I took it that you are taking a break to figure out how to grow more dahlias to supply your customers better. I, for one, am very excited about what you are doing. I have tried in vain to order tubers the past few years, but have never been able to get to the site before everything is already sold out. I am hopeful that your time reassessing and building stock will allow more of us to order in the future and that it good news for all of us. Good for you, Erin–Floret offers all of us so much inspiration, experience and beauty–and now you are modeling for us the importance of “hitting the pause button” as a small business owner. Thank you. I’m happy to hear you are hitting the pause button. I have heard through many some disappointment in the quality of your dahlias. You are an important part of this flower farming movement so it’s crucial you do it right! Good for you for taking some time to learn and figure things out. I have a few ideas. Some; you maybe already know- others you may have some different views on. 1) you are planting those dahlias too close together. To get decent tuber size, you need to plant them further apart. I know this is against a model that has worked well for you with many of your other crops and you have inspired many flower farmers to follow suite. I just don’t think it works for dahlias. I plant 20 inches apart; and I think that’s pretty tight. Dahlias are heavy feeders and they are stealing eachother’s nutrients if they are too tight. 3) don’t keep tubers that are tiny unless you want to really fuss with storing them carefully. I may get 10 tubers off a plant – but I would only feel good about shipping maybe 3 or 4 of them out as the others are just little pieces. 4) Build good stock. When I am adding a new variety to my collection – I like to buy it from a few vendors and then look for the healthiest stock to multiply. I only dig 75% of my plants in the fall. I eliminate anything that lacked vigor or showed any signs of virus. Hang on to a variety a few years before offering it for sale in order to multiply only the best stock. 5) Don’t fertilize after August 1st. when you promote green growth above ground – your plants aren’t able to focus on building tubers under ground. 6) Hire some staff that have lots of dahlia experience. Dahlia nuts that have been a part of dahlia societies, maybe done some breeding, worked on another commercial farm etc. You have all the makings of a beautiful opportunity for the right person. 6) Put the horse before the cart. :) Good for you for hitting pause. You have grown so quickly and some projects take a lot more time. Dahlias a fickle. They take time to get to know. I have been growing for many years; but still make really dumb mistakes all the time when I am trying something new. If I could send a picture of your dahlias growing in my back yard I would. I set my alarm to wake precisely when your dahlias went on sale. I was able to get a few but not all I wanted due to others doing the same. Even though I live in California I would gladly volunteer a week of my time to helping get these treasured tubers to market. I understand the need to reevaluate. I will be sad to lose you as a resource for my precious dahlias. Thank you for what you do. Your IG posts and educational blogs have been pure joy. Your book has been a treasure I have devoured. The first year I grew dahlias were for a wedding job. To my ignorance and grace they came up the next year in mass. I had left them in the ground. I made weekly bouquets from June until November giving them to the nurses taking care of my husband in the chemo ward. My grouchy husband became the most favored patient as he always came with a lovely bouquet of dahlias. Whatever you decide we dahlia lovers will understand as all your flowers are a treat. Looking forward to your new book. I agree with Lisa. It seems short sighted to get rid of the thing that brought you the attention and expansion in the first place. Calender/notebook/gift item sales are possible because of all the attention your dahlia and flower sales have brought to your company. I learned of you on Pinterest last fall and wanted to place a dahlia order but you were completely sold out. Your seeds intrigued me so I signed up for your emails, purchased quite a number of seeds from you this past winter and was hoping to get some dahlias ordered ths fall. Now, as lovely and charming as your operation is I wonder why I should stay interested? Best of luck to you and your business! I was looking forward to order your dahlias next year and beat the crowd. So I am definitely disappointed but understand. It’s so nice to order with confidence knowing you’ve tested, tried and back your selections. We trust you and that’s why we want your dahlias and will order many. Keep us posted. Can you tell me where you purchased your vases in this blog post and what they’re called? I use your shop as a curated list of things that will do well if only I can get my hands on them, even if we can’t get them from you. We deeply appreciate your field tests, and depth of knowledge. A forum for this might be incredibly helpful going forward. Did you try Fleurel? How did it do for you? What might be a good substitute, etc. I too look so forward to the Dahlia Palooza each year and though I am usually unable to snag those I’d like most, I am always thrilled with the Dahlias I’m lucky enough to grab. It’s surely understandable what a challenge it must be for Floret each year but I am incredibly saddened to hear you won’t be offering them for next season. No one has a selection as beautiful as you guys do!!! Is the decision a forever one or just the 2019 season? It was quite by accident that I discovered the Floret Instagram Account and for that happy coincidence began my love of dahlias. Sure, I’d heard about and seen them since childhood but not to the degree of what is available at the Floret Farm. Through the various postings it became clear just exactly how limited my selection is. 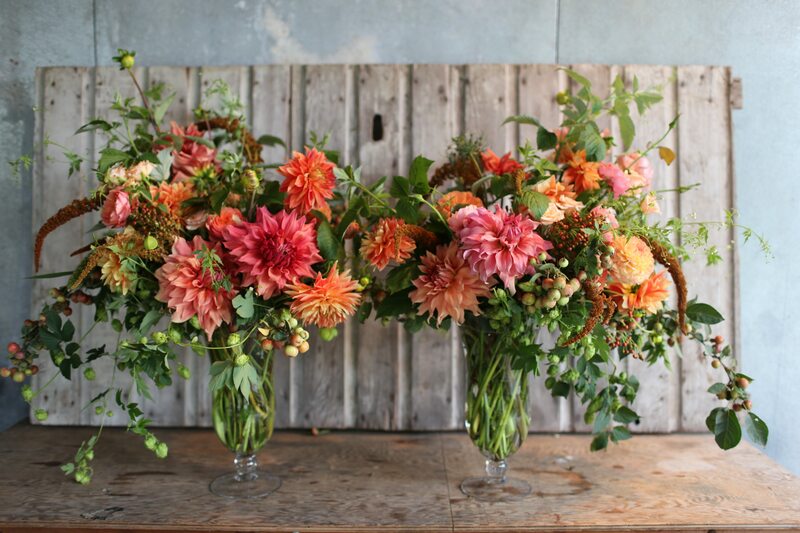 All the beauty provided by the pictures however is merely a temptation as I live in Canada and ordering dahlias from Floret is not an option. If perhaps with the new farm expansion this would now become a possibility it would be wonderful. I’d love to share on a dahlia discussion group: people’s favourite varieties (and why), how they sell them, various experiences growing dahlias, etc. This is my fifth year growing dahlias (and flowers for market), I started with 3 varieties my first year, 6 the second year, and now I am up to 70 varieties. I avidly read all of Floret’s comments on the varieties they grow (plus other comments on the internet wherever I could find them!). Dahlias are the basis of my summer production (from end of June to mid November) and one of the flowers that grow best where I am, so I depend on them a lot! I must admit that’s hard to hear ! I’m one of those who has missed out on the Dahlias , due to the quickness of the sales ,so keep hoping for the next season. But, I do understand,and will continue to wait until the Dahlia market is alive and well !! Things to look forward to…. I understand, and glad you are building your stock of dahlias! They’re my favorite too. I love your story, and can’t wait to purchase from you! I started growing and selling cut flowers on my residential property a few years, and i added dahhilas to my inventory last year. I was already maxed out of space so this year I rent a plot from my community garden which I intend to use for my dahilas. I have followed you and purchased your book once I decided that I can be a cut flower grower on my less than 5,000 sq. Property. You are an inspiration to us all and I believe if taking a pause is required in order to produce greatness than I say take the pause! make yourself a happy bed of dahlias at your home and let everyone else fend for themselves. Keep a little stock in case the wind gets at your back again and you want to resume. Know your limits. And then sometimes all you need is a break……right? Another option, hand (sell) the whole dahlia operation over to someone else . We are not the only ones who can love (our children). Or, drink more coffee. Lol. I’m pleased to see that you are stepping back and assessing. There are a finite number of hours each day, as you well know. Our children grow up quickly. You are a family business. Do take some family time. You can’t get it back. What disappointing news, but as a small business owner in the middle of massive growth as well, I completely understand. I’ve been incredibly happy with the quality of the products you’ve offered both in seed and dahlia form and know sometimes you have to step back in order to maintain the integrity of your product or service. Your growing tips and book have helped me move from a novice gardener to an intermediate gardener. I had no idea you were doing online workshops and hope this continues in the future. Have you considered a kind of rotating list for purchases each year or a VIP membership that expires every two years? I’d recommend a deposit requirement for a waitlist which could be applied to membership or purchase, but that way you eliminate duplicate waitlisting and individuals who are not necessarily serious. You could offer some free seeds as interest! You could sell memberships, which allow for a set amount of quantity (perhaps 3 different pricing/quantity levels) and then after you purchase for two years, you cannot purchase again, until you are up again on the waitlist if you chose to add yourself back onto it. It’s not ideal, but it would allow you to control production to a manageable level, and create an orderly system while you continue to find production resources experienced enough to harvest your stock. I guess I don’t understand the calendar/notebook/gift item sales over actual plants. I feel like this dahlia decision is a mistake. You don’t need to just expand at any cost, leaving the thing that people love about you behind in order to mass-market. I’m bummed.